The new cloud-based, broadcast TV recording service Aereo just went live in New York City. It was sued by major broadcasters even before it was available, and with good reason: We took the service for a spin and it's good enough to make that cable contract feel even more useless. Would You Ditch Cable If You Could Still Watch TV Anywhere You Want and Anytime You Like? 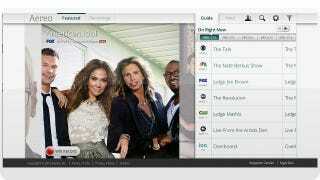 For $12 per month, Aereo will serve as your web-based DVR for any channel you can get for free over the airwaves. There's no need for a special box or a cable contract—everything is controlled over Aereo's easy web interface. If you live in New York City, head over to Aereo and request an account. Aereo is handing out invites on a rolling basis. You should expect to have an account within a few days of your request. Once you're in, Aereo offers 90 days of free service to new customers. (If you don't live in New York, you can't access the service yet.) When you login, it uses your device's connection to determine if you're in the viewing area. If you are, you can access video content. An Aereo rep told us that they're "not discussing other markets at the moment." I was able to use Aereo easily on both my MacBook Pro and my iPhone. According to Aereo, the service works with iOS devices, Roku, AppleTV and MacBooks. Support for Android devices is on the way as well. If you've never set up Aereo on the device you're using, the service will prompt you to create a profile for it. Each account can be used on up to five devices. On computers, the service only works in Safari but support for other browsers is coming as well. Once you're set up, the Aereo home screen shows links to featured content, your recordings, and a channel guide that shows you what's on and what's coming on later. Links can connect Aereo to Facebook or Twitter, and links operate a search feature and open the account settings. Click "record" for particular program, and you'll the same options you're used to seeing on a DVR. You can record it just this one time, schedule it to record all upcoming new episodes, or every single episode that goes on the air. If the show you want to record is already on, you can only record from that moment on—so if you missed the beginning, Aereo won't magically record it from the past. Your Aereo account gives you two web-based antennas, which means you can only record two different channels simultaneously. There are two ways to watch TV on Aereo. You can either watch live TV on over 20 broadcast channels, or you can watch the shows you've recorded. Aereo lets you store up to 40 hours of recorded TV and you can watch it anywhere in your area as long as you've got an internet connection. The quality of the streams is pretty good—not HD, but totally watchable on my 25-inch monitor. It depends on how you're going to use it. If you want to record your favorite news broadcast or sports, Aereo is a godsend. It's impossible to get this content without cable or expensive sports streaming packages. On the other hand, if all you're interested in is a look at primetime network shows, Hulu is a better deal at just $8 a month. That said, Hulu doesn't have absolutely every show and most of the content is delayed by at least a day. We've known from the very beginning that Aereo stands on shaky legal ground, but the service does seem to have a pretty good case for its existence: You're allowed to record TV for your personal use. So as long as Aereo is just recording it for you, and the TV is freely available anyway, Aereo is theoretically in the clear. Broadcasters have already sued Aereo and you better believe they're going to fight the service as hard as they can. They paid a lot of money setting up deals with cable and online providers to provide you very similar on-demand services. They're not too happy that Aereo isn't paying them a dime for their content. Aereo might not last forever, but we sure hope it does, because it's a pretty excellent option for people who hate cable.